Well hello to you my reader chums! Thailand, the land of smiles, crazy cities, stunning islands and gorgeous nature should be on everyone's bucket list. 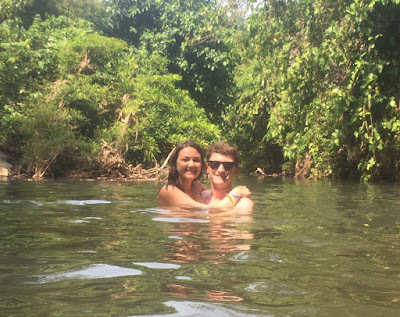 In February, I went with my boyfriend for 5 weeks and loved every single part exploring a new culture and seeing everything the country is about. The country's calm vibe, beautiful temples and golden sands were as dreamy as I imagined. Thailand is very large and often enough it's hard to know where to begin planning and which areas you should visit on your trip. 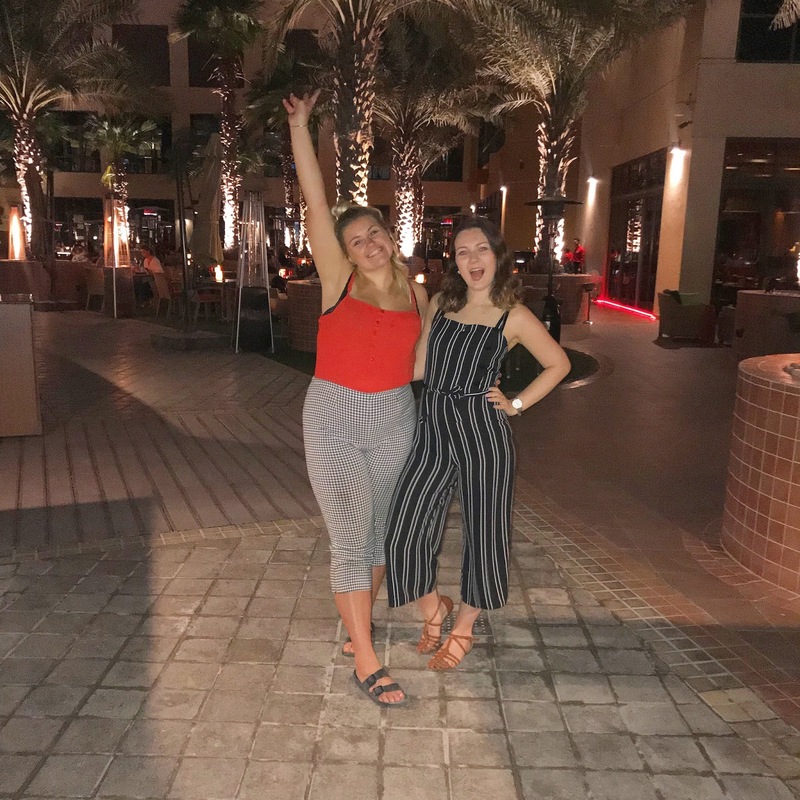 I did a lot of research prior to mine and after experiencing the itinerary, I think it's safe to say we got everything out of the trip we wanted to and saw a large chunk of the country. Bangkok isn't for everyone, some will adore the rush and craziness and others will shy away from its party scene. However, when you're in Thailand, you have to see it to make up your opinion. 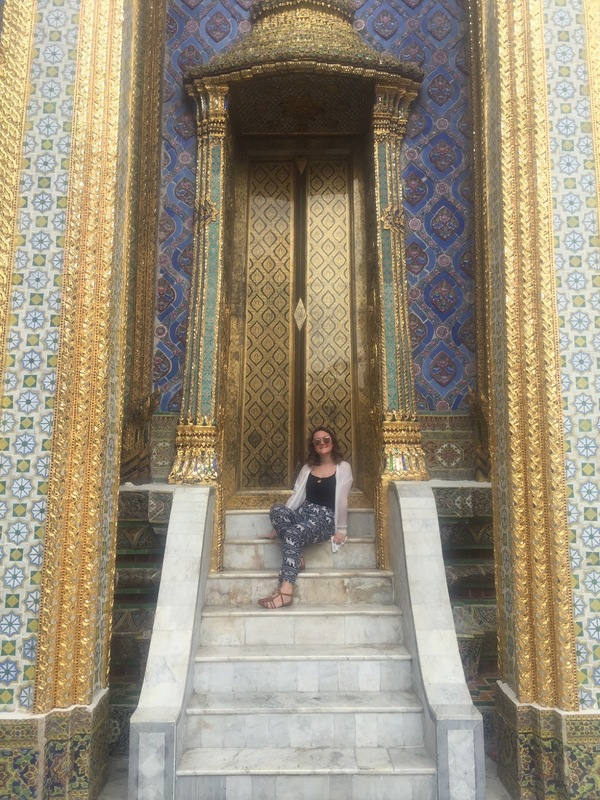 I wasn't the biggest fan of Bangkok as it was very manic, but, the city does have some beautiful sights which are worth exploring if you're not a party goer, that I would recommend 2-3 days to get the full city experience. You could easily just go for one day if you were really put off by the loud and busy atmosphere, but it is the perfect place to start to kick start you in the direction of Thailand's culture. Chiang Mai was such a diverse change from Bangkok and I fell in love with it from the off. It's one of those cities that you could browse around for days on end and never get bored. I adored Chiang Mai's vibe; it was calm and content, and all the local people seemed a lot happier than in Bangkok. The Old City was my favourite area and is the place you could generally enjoy a walk around as there is so much to see and sweet place to eat and relax. 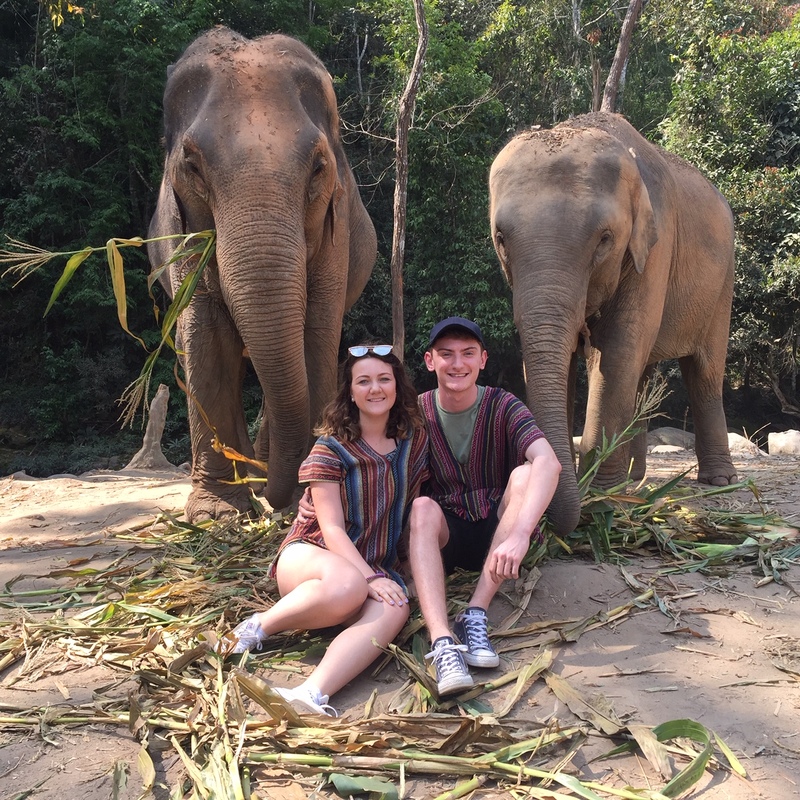 Chiang Mai is also a beautiful hub for elephant sanctuaries, cooking classes, day trips, temples and more, and you could honestly spend 5 days or more soaking up the beauty. I would definitely recommend dedicated quite a few days on your trip. Pai is a small town 3 hours north of Chiang Mai and one of the quaintest places I've ever visited it. If you want a few days to taste the spirit of Thailand and eat in some of the loveliest places, you need to add it to the agenda. You can easily spend a few days in Pai, seeing the few sights it has and then by spending the rest of your time there exploring the quieter areas of the town. Its night market was one of my favourites with so much food variety, and despite the town's size, it has so much to give. You can't have a trip to Thailand without the bustling island of Phuket. Phuket is probably the most touristy island I visited, however, its old town, market and slightly less known beaches made the few days very memorable. I'd recommend a couple of days in Phuket to soak up the busy beaches and see the touristy sights and spend more of your time on the quieter and less touched islands of Thailand. If partying or resorts are your thing however, a longer stay in Phuket would be right up your street. Phi Phi was on the same level of Phuket, but the beaches and waters were a lot nicer. Undoubtedly, Phi Phi is known for the party vibe and hosting the best beach parties, however, it's also a hub for great day trips and swimming. 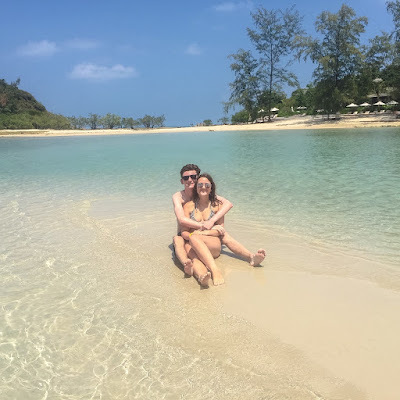 Like with Phuket, I think you only need a few days in Phi Phi to experience the party lifestyle, get a boat tour over to Maya Bay and of course get that suntan. Personally, on our trip, I think we booked too many days in Krabi and could have done with a day less there and spent somewhere else. Krabi's town alone is pretty quiet and non-touristy with only a handful of bars and good restaurants. However, the main hub of Krabi is its day trips which we adored. Railay beach was beautiful, and there are several other beaches and day tours you can do from the town. Krabi is the perfect central point for quite a few excursions and pretty cheap to stay too. Koh Lanta is probably one of the most dreamy places I've ever seen in my entire life. Its secluded beaches, crystal clear waters (I'm not kidding), and quiet atmosphere is what every beach destination should be about. 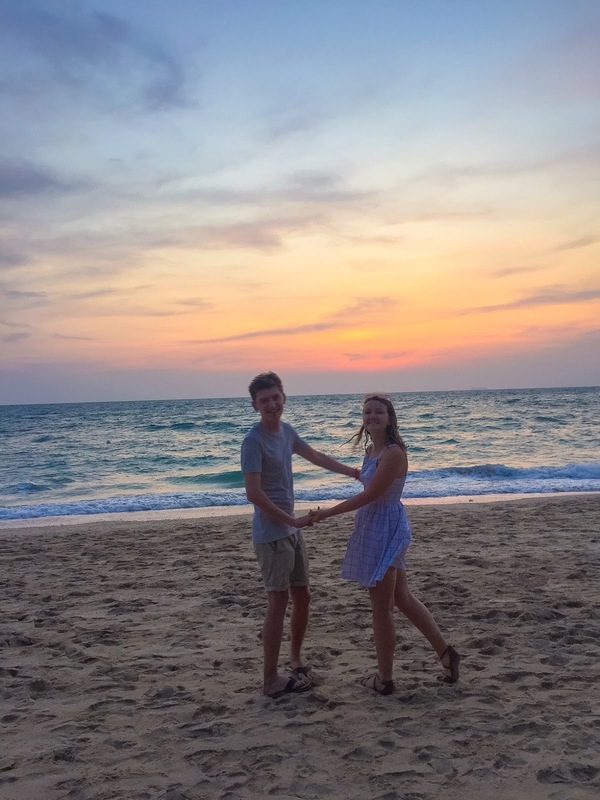 Despite its rise in popularity in recent years, Koh Lanta felt like it was ours. Even the most popular beaches and 'tourist' areas weren't overly busy and I loved that. My favourite reason I loved Koh Lanta was how vacant some areas were, and how you could literally go on the really southern beaches with nobody on. It's hard to put into words how beautiful the island is and how the waters there were literally like a bath. The island was also really eco-friendly which I loved, promoting regular beach cleans and having steel straws everywhere. Koh Lanta is one not to be missed and I could have easily stayed there longer than the 4 days we had. 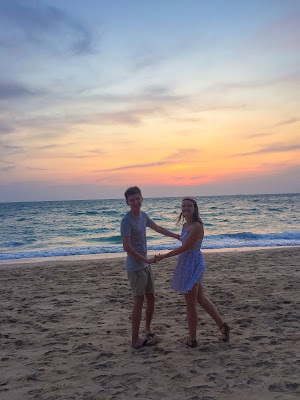 Koh Samui is probably on the level of Phuket with a resort holiday vibe, however, it can make the perfect break on your trip to have a chill holiday few days- and that's what we did. 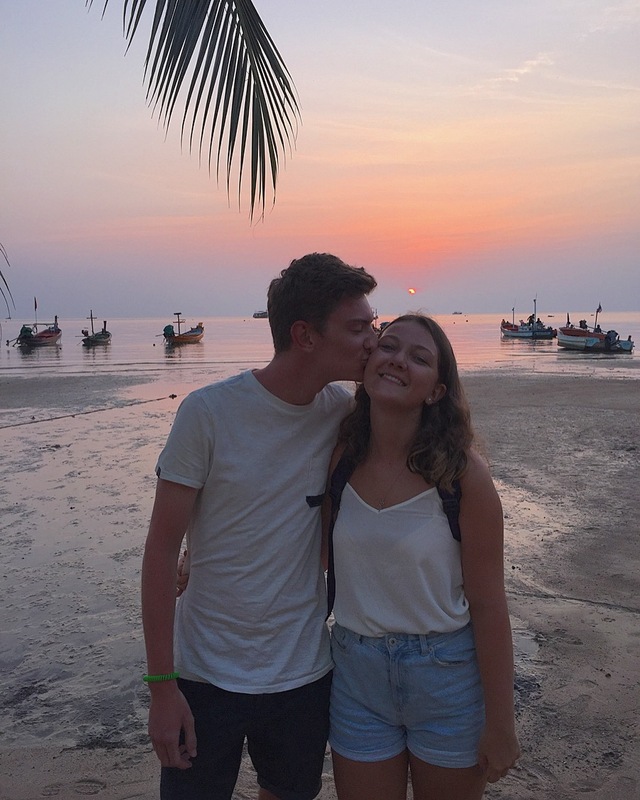 We booked Koh Samui over our anniversary and that's another reason why we used it as a holiday spot. Koh Samui is a pretty large island, larger than I expected and has a few different areas which you can stay in but it depends on what you want for that trip. Chaweng, for instance, is the most touristy and party vibe but other areas such as Choeng Mon and Taling Ngam are a lot quieter. Over the week we were there, we were able to have a taste of most beaches and areas, and really got a grasp of Koh Samui. Resorts may have taken over some of its beaches, but it's the perfect place to relax, indulge in good food and cocktails on the beach. Another party paradise, Koh Phangan is famous for its full moon parties and wild nights out. Yet, there is a quieter and chill side to Koh Phangan than meets the eye, and it's a really pretty place. Our time in Koh Phangan was a pretty chill one, as we were there at the wrong dates and missed the full moon party. I enjoyed seeing its calmer side and exploring the island. 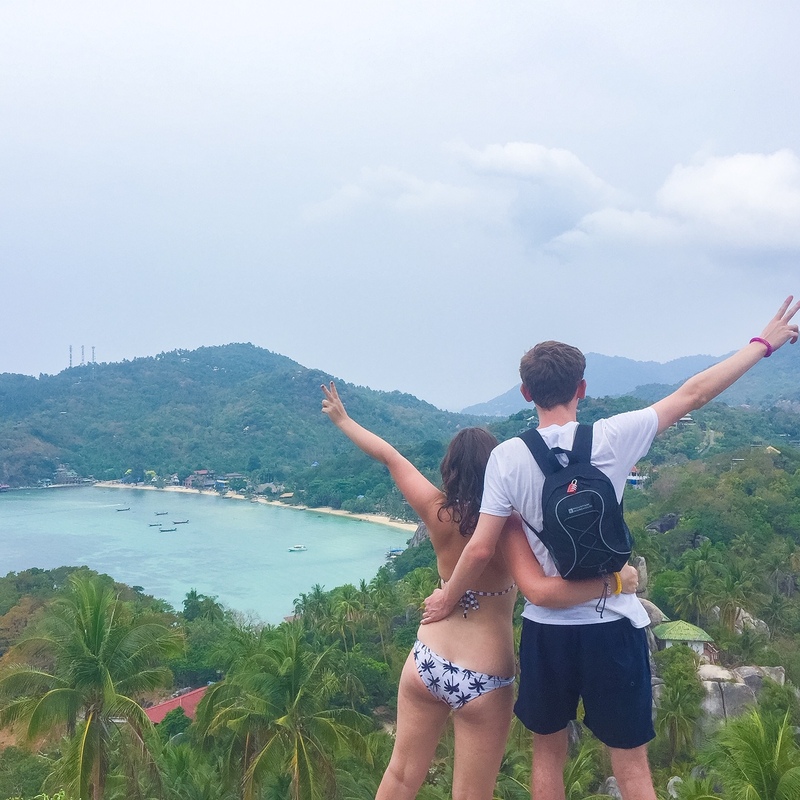 I fell in love with Koh Tao like Koh Lanta. Although a small island, it has a lot to give and offers that more secluded appeal. If you hire a motorbike, you could pretty much drive the course of the island in an hour, and I love that. The communal feel, the quieter beaches and clearest waters I've ever seen were something out of a postcard. We were only there 3 days, but I could have happily soaked up the calm atmosphere for a few more, visiting the beaches and quaint coffee shops they had. Despite the size, Koh Tao left a huge mark on my heart, and I would recommend a visit for all. It's an eco-friendly paradise with the friendliest of people and perfect for waters for snorkelling and swimming. Any water babies would adore this island! Thailand was one of the most stunning countries I've ever visited and I would highly advise seeing it once in your lifetime. The people are so giving, the beaches will make your heart skip a beat and the fresh food is on another level of tasty. By visiting all these places, I was able to get a full look at all areas of Thailand from the north to the south. 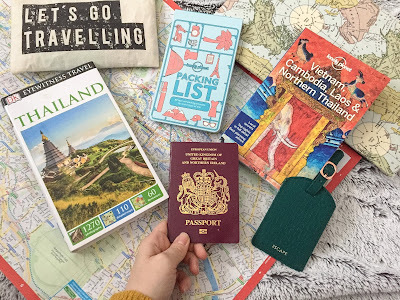 I hope you enjoyed my suggested 5-week itinerary for Thailand! Would you add any other places to this list? Well hello to you my reader chums! Dubai, the city of skyscrapers, pristine beaches, the desert and every designer shop under the sun, is certainly bucket list worthy. Before my boyfriend and I went backpacking for 2 months, we jetted off to Dubai for a 5 day holiday to see what the place is all about. I didn't expect to fall in love with Dubai the way I did. As it's a pretty man-made city I thought that wouldn't be for me, however, the beauty of every building, sight and its beaches made me swoon. 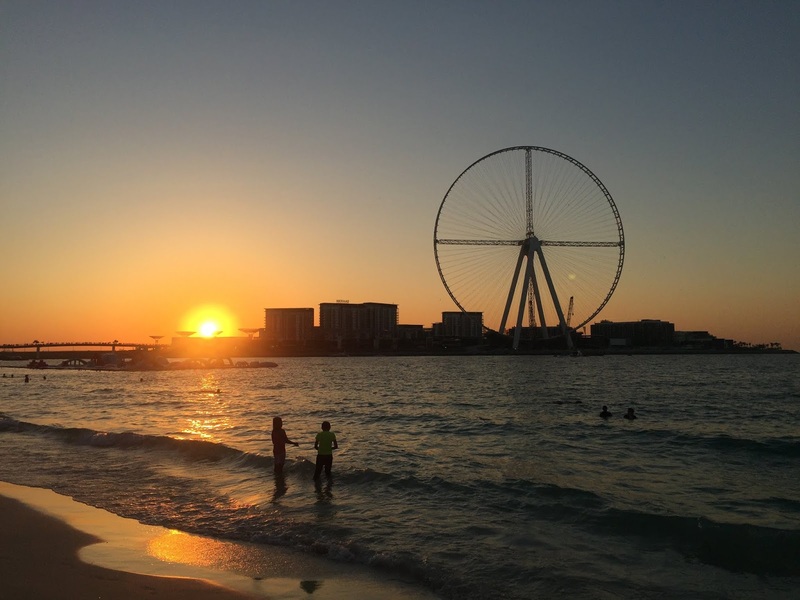 Dubai is definitely a plush holiday destination that can be done on a budget, you just need to know where to look. We spend 5 days there and I think it was the perfect amount of time to soak up the sights, do a few excursions and have that chill holiday experience. We flew overnight with Virgin Atlantic to Dubai and landed early morning, ready to head off to the hotel. 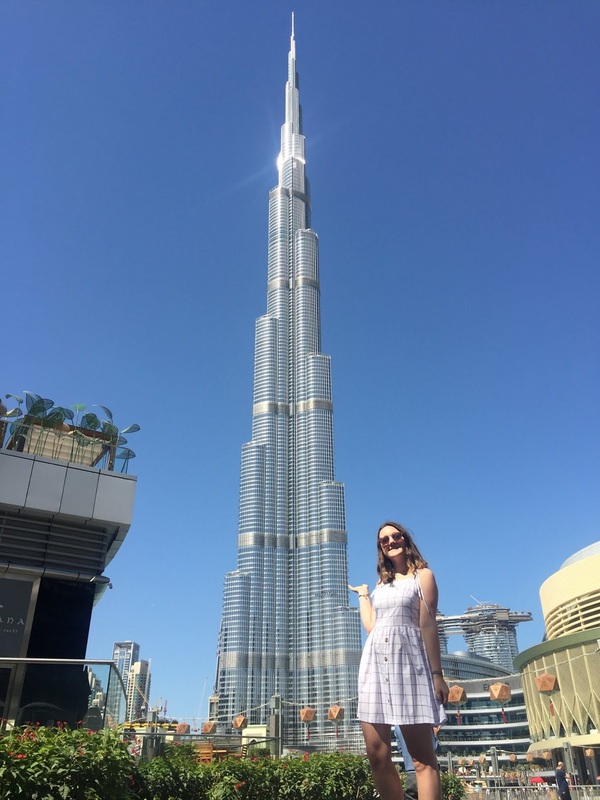 Our hotel, the City Premiere Apartments was located in the Business Bay area, close by to the Burj Khalifa and Dubai Mall, and took around a 20-30 minute drive from the airport. On our first day in Dubai, after checking into our hotel and napping (we barely slept on the overnight flight), we got a taxi to Jumeriah Beach. However, I think the taxi man misheard us and dropped us off at Jumeriah street which is where the Le Mer area was. Although it wasn't exactly where we wanted to go, I really loved the place. Le Mer is brand new and kind of reminded me of a theme park. There was a small beach, plenty of activities for kids and loads of quirky restaurants and juice stalls. 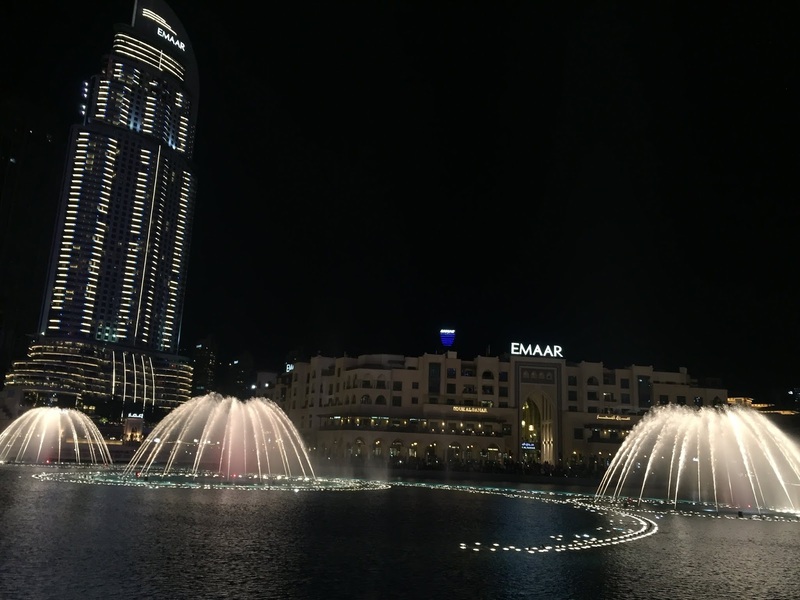 It looked very animated but made for a lovely first place to absorb the 'new vibe in Dubai'. After a few hours there, we returned to our hotel as we planned to meet my best friend Chloe (she just moved out there last year) for dinner. She picked us up and took us to this gorgeous restaurant, The Rosette which had beautiful night time views of the city and Jumeriah Beach. The food was amazing and since it was Ladies night, Chloe and I got free drinks. After dinner, we took a stroll down to Jumeirah Beach and it was everything I imagined and more. 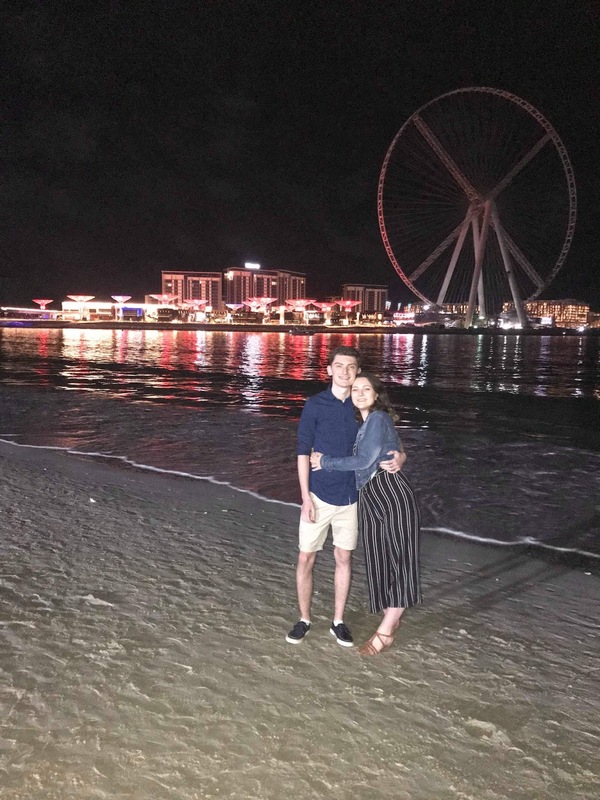 Under the night sky, the beach was lit up by the Ferris wheel and bright lights of the city - it looked beautiful. The beach area was surrounded by plenty of shop chains, markets and we soon became quite accustomed to this area and knew our way around. We finished the night with my first ever visit to the Cheesecake Factory and it was insane. The second day we had planned for a while, as it was our first proper full day in Dubai. We hopped on the tube at Business Bay metro station (about a 5-minute walk from the hotel), to the Dubai Mall which was only 1 stop. From the metro station into the mall, the walkway was around 10-15 minutes away. Once we arrived, we couldn't believe our eyes! The mall was huge - bigger than Bluewater and Stratford put together with every named brand under the sun. If you're looking for a major shopping trip - this is the place. We'd had our Burj Khalifa ticket booked for the afternoon so our first stop was the aquarium and underwater zoo. 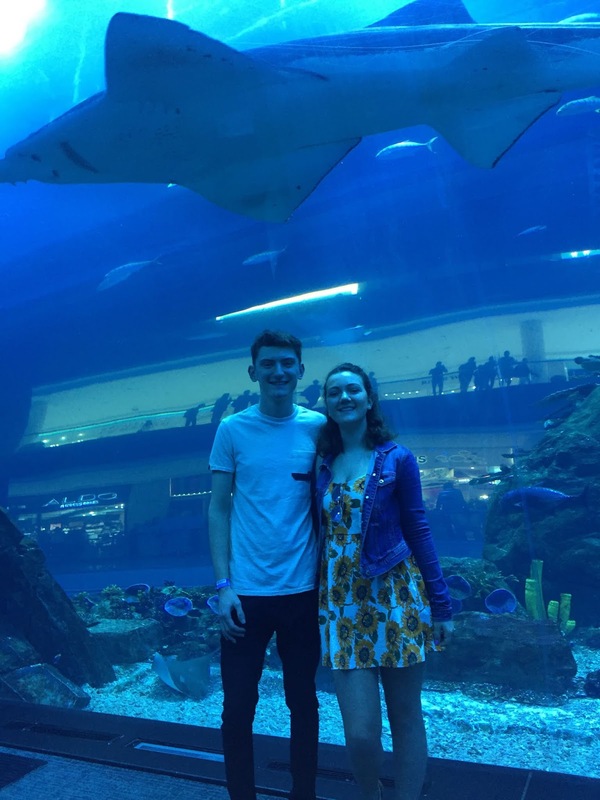 Dan and I adored the aquarium - there was everything from a variety of fish to parrots, sharks, crocodiles and hedgehogs. The animals were beautiful and it was really interesting reading about every creature. The aquarium was bigger than I thought, but I think my highlight had to be walking through the underwater zoo at the end. It was so cool seeing the sharks swim above you! Our next stop was the Burj Khalifa. As the entrance to the Burj was in the mall, we didn't have to travel too far to reach it from the aquarium. Our slot was booked from half 2 onwards so we lined up (which took quite a while), and then got in the lift and zoomed up to the top. The lift itself was really cool as you could see how many floors you were going up. Once at the top, we stayed there for a few hours, taking in the views, getting those candid Instagram pictures and generally being wowed by the experience. It's certainly a must-see thing in Dubai! The view of the entire city will honestly blow your mind! 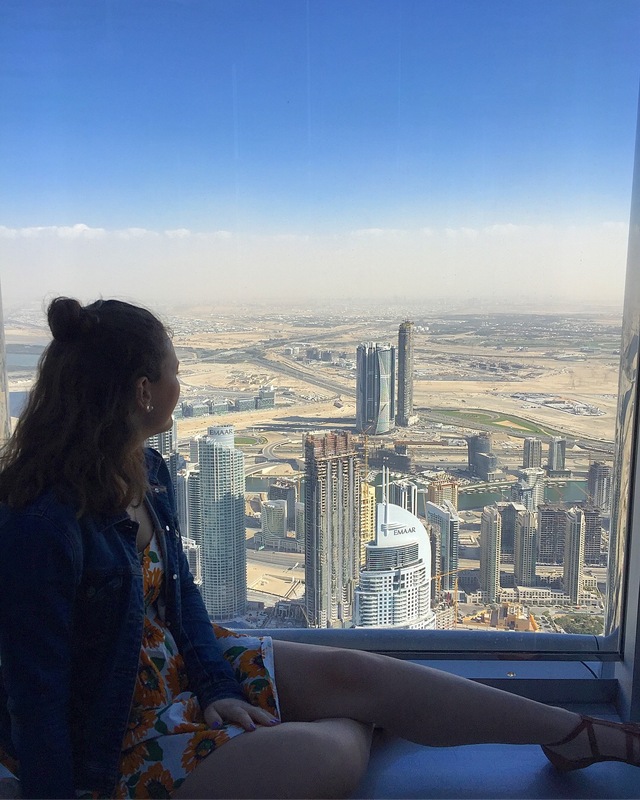 I was able to see the entire city, the desert and the ocean that surrounds part of Dubai - it really is out of this world. If you have the chance, try and go to the Burj just before sunset, as then you'll have the experience of seeing the city turn from day to night. 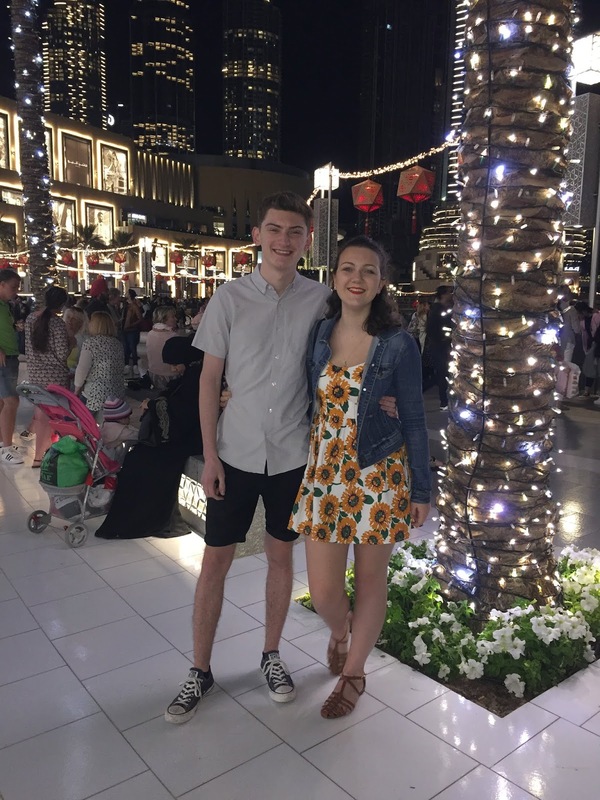 We then stopped home and returned back to the mall for a spot of shopping (it had to be done) before the fountain show began. The show starts at 7 or 8 and runs every half hour for 5 minutes. As we were there during the Chinese new year, the animations used by the show were all in that theme. The fountains are really impressive and make for a lovely show! We then finished the night with dinner at Eat Greek - the perfect Greek place. 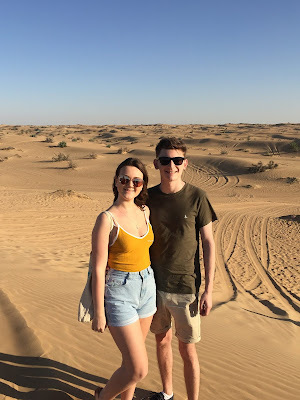 The third day, we had our desert safari tour booked at 3pm so we had a good chunk of the day to explore! We started off at CityWalk as we go recommended to head over that way. CityWalk was a modern and mini outdoor version of Dubai Mall but a hell of a lot quieter. The mall was home to many quaint coffee shops and designer stores, that you could easily spend a few hours browsing. We then went back to the mall as it was so close to our hotel for lunch before our excursion began. Our driver picked us up in a massive jeep car and we were the first couple to be collected. The ride wasn't too long to the desert, probably around 40 minutes. We first stopped in the entrance to the desert for photos and our tour guide took some pretty funny ones then, it was time for dune bashing into the main heart of the desert. At first, I really liked the dune bashing as it was a lot of fun, like a rollercoaster. However, after a while (it lasted for an hour), I got super car sick and didn't like it! Dan loved it though! We then continued to drive through the desert which was really cool, seeing the endless sands, which literally went on for days. 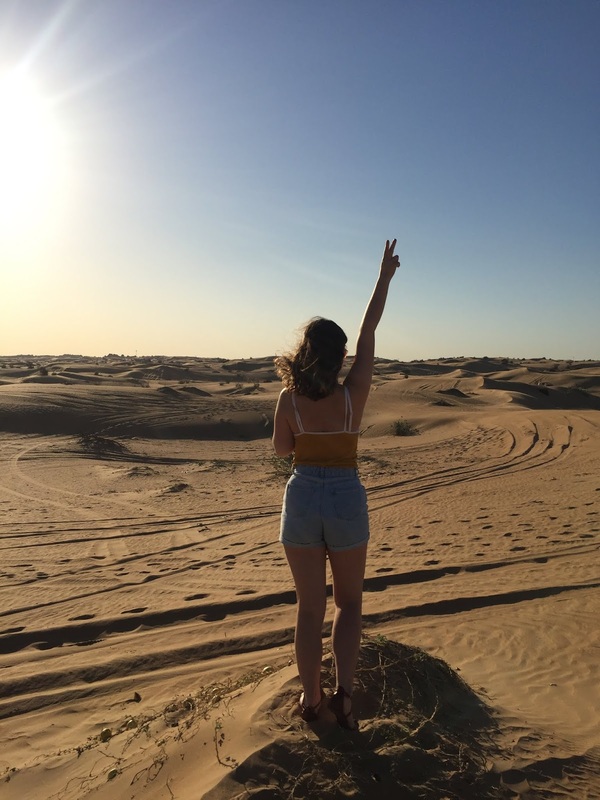 We then arrived at the desert camp - where you could ride camels (I felt really sorry for them), go sandboarding, get hennas done and given food on arrival. After mooching around the camp, it was time for the evening show. The evening show featured a few belly dancers and a fire show - it was amazing! The fire show was absolutely incredible - I was surprised by everything that they could do. Then we had a traditional Arabic feast - it was basically all you can eat, and absoultely delicious! I loved it! We made some friends and watched the rest of the show before getting the car home. If you're in Dubai on a Friday, you have to attend a traditional Friday brunch. Dubai's weekend runs on Friday and Saturday so to celebrate on Friday a lot of places hold incredible all-you-can-eat brunches. 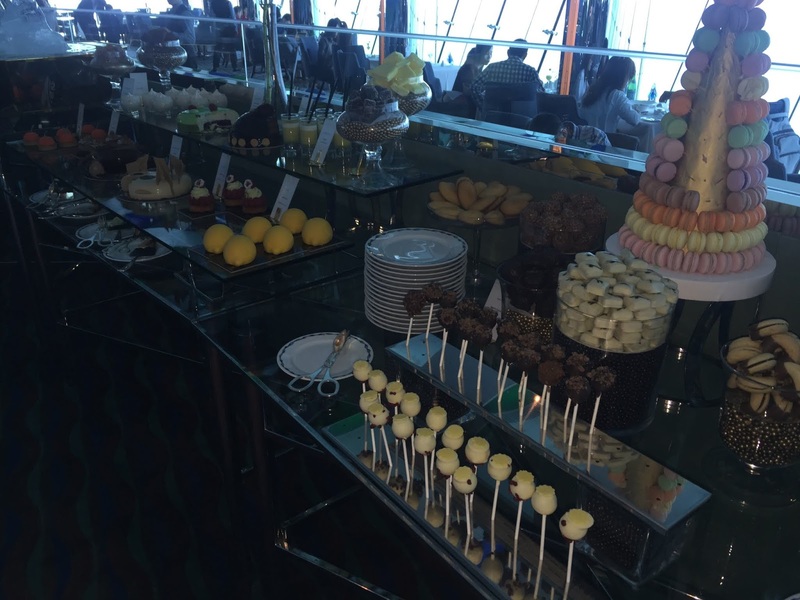 For our Friday brunch, Dan treated me to Friday Brunch up the Burj Al Arab. I couldn't believe it when we first entered the 7-star hotel -it was insane. Every detail looked so luxurious and we felt so underdressed, despite dressing up. The decor reminded me of the Genie's lamp in Aladdin! 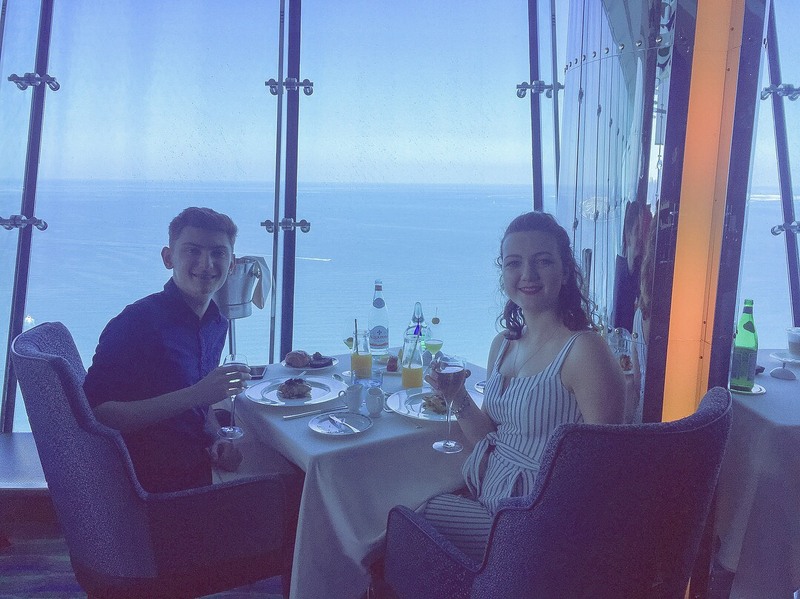 The brunch was held on one of the top floors at the restaurant Al Muntata and we took the lift up there. From the lift we could see all the sea, the Palm and more of the city - it was beautiful. The restaurant was also really luxury, and the food put out went on for days. With our booking, you got a starter, main and glass of champagne and then could help yourself to any of the food buffets. 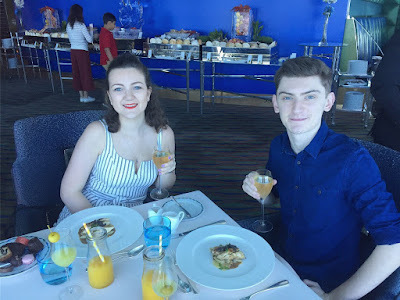 There was too much on offer - a whole selection of pastries, desserts, cheeses, fish, meats, bread, homemade pancakes, and ice cream - and fresh juices. It was hard to fit it all in! The food was some of the best I'd ever tasted and I felt so grateful to Dan for the incredible experience. I'd highly recommend doing it - it's a once in a lifetime sort of treat! 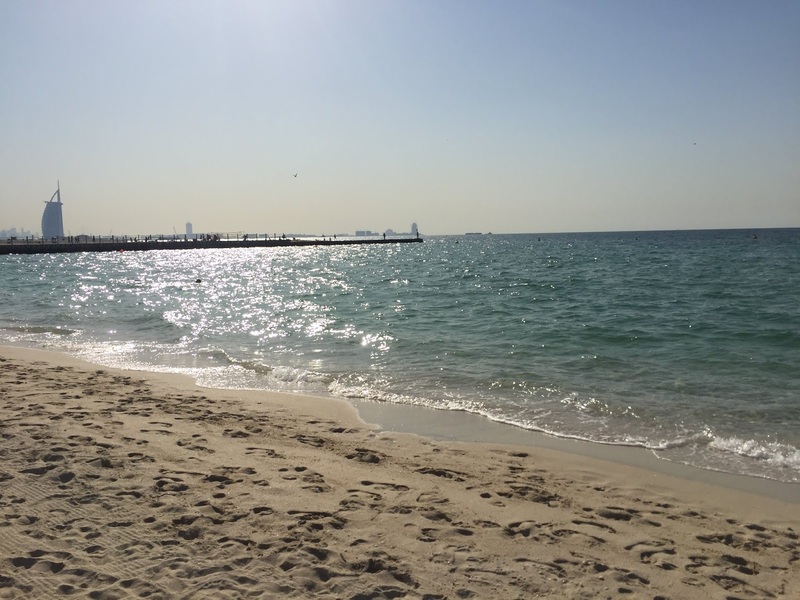 With our full stomachs in tow, we made our way down to Jumeirah Public beach to let our food go down and relax. The beach was around a 15-minute walk from the hotel, and we spend a while soaking up the views and sunshine. We then took a taxi down to the Atlantic at the Palm, just to see it all really. 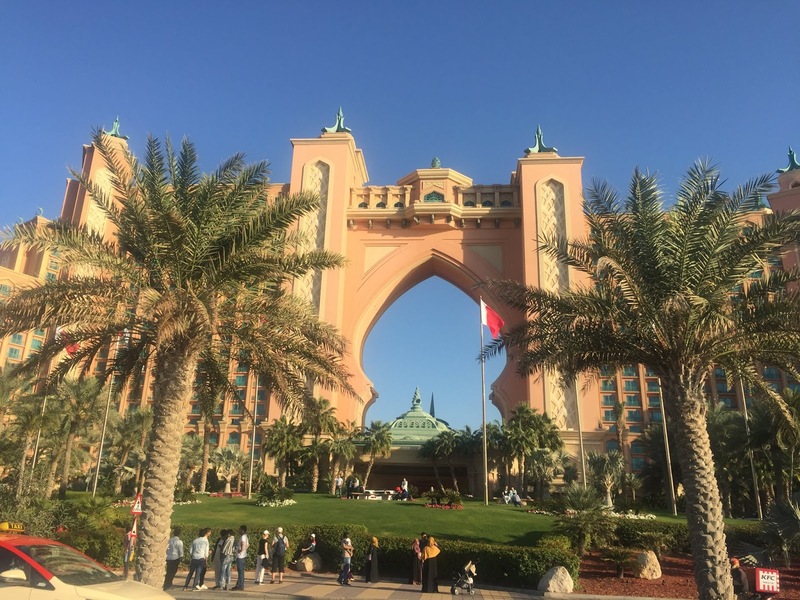 We didn't have much time there, however, the Palm is huge, and there is so much you're able to see or do there that you could spend a whole day! To finish off the most beautiful day, we went over to the main Jumeirah Beach area and watched the sunset. The beach was bustling with families and groups of friends, and the vibe was just so friendly. 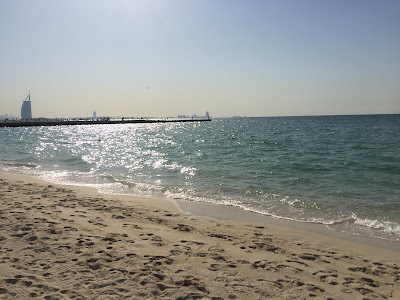 I really loved the Jumeirah area as the beach was gorgeous, it was surrounded by shops and had such a calm vibe. Despite the massive lunch, we still had room for dinner at a lovely Italian on the beach. 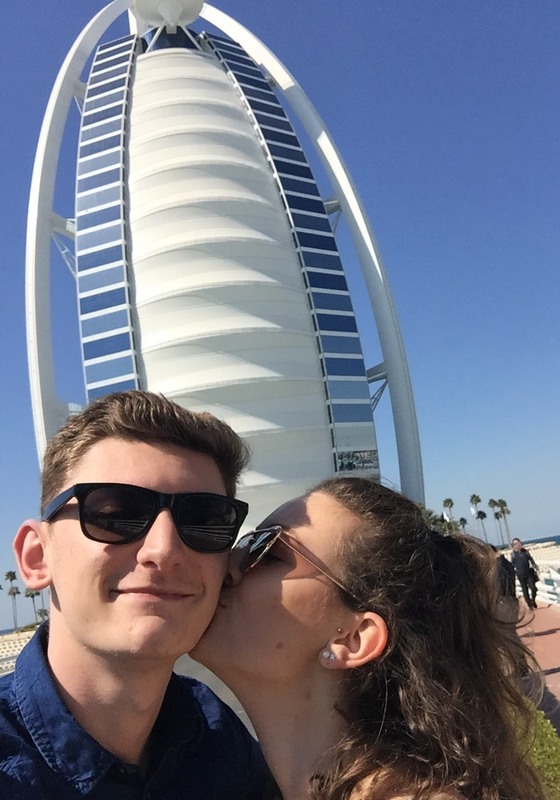 Our last two days in Dubai were very chill! As I mentioned previously if you go for a longer stretch of time after you've seen the main sights, you'll have the extra time to lull about, see the beaches and just relax, and that's what we did. On the Saturday after a morning at the pool, we headed over to Kite Beach, as it was one of the beaches we hadn't visited yet. The beach had powdered sands and the water was lovely! We chilled there for a while, went for dinner and later in the evening, head over to Jumeirah Resort. My friend Chloe took us to the restaurant the Black Tap as they served the most delicious freak shakes there! I chose the brownie one and it was honestly so sickly. The Black Tap was a chain in Dubai, so you'll easily be able to find one on your trip. The last day in Dubai, we got the metro over to Dubai Marina, as that was the only thing on my list we hadn't seen. The marina area was absolutely stunning filled with boats and surrounded by ever-growing skyscrapers. It made for a lovely calm stroll, and the chance to soak up our last few hours int he desert city. The Marina also has its own mall which made a lush spot for our final lunch there. Dubai was everything I could have dreamt it to be and I feel so thankful to have experienced it in all its glory! The Friday Brunch, its beaches, the Burj Khalifa, the mall and the desert safari are among the highlights. It's a beautiful city and the people are just as lovely. Dubai, I'll be back soon. The best way to travel around Dubai is either by the metro or taxi. The metro has two main routes that go either way on one side of the city, and on the other side, it's the same but to other areas. Taxis are fairly cheap in Dubai, and usually to get from one main site to the next, it'll take around 30 mins because of how the roads are made. When you're on the metro, look out for where you're standing! Some carriages say 'women and children only', and others can be for gold class ticket holders. or the Palm will suit you more. Like any big attraction, book your tickets to the Burj Khalifa in advance to avoid additional queuing and time wasting. If you are looking to drink alcohol out there, be mindful that it is a Muslim country and some restaurants and hotels will be dry and not serve booze. Before you go somewhere, ask if they serve alcohol or not. Dubai is a super friendly city and its workers will do anything for you - I'm talking packing your shopping, doing the payment for you etc. I hope you enjoyed this Dubai guide. Have you visited the city? Well hello to you my reader chums and welcome back! 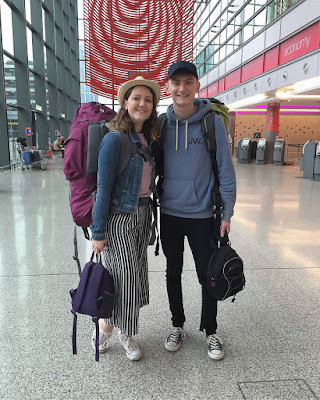 It seems only yesterday I was typing the post about heading off travelling and now I'm back and excited to share my experiences with my loyal readers. If you're new here, in February, I jetted off travelling with my boyfriend for 2 months to Dubai and around different countries in south-east Asia and documented the journey over my Instagram along the way. After two months and the trip of a lifetime, I'm left on a high with a lighter backpack, more wisdom, memories and worldly knowledge at my fingertips. Asia was a whirlwind in the best kind of way, I saw a different way of life, I tried the yummiest of foods, and learnt plenty of history I wasn't even aware of. It was a new and exciting lesson I enjoyed learning more about every single day, with a mix of every kind of fun and adventure in between. 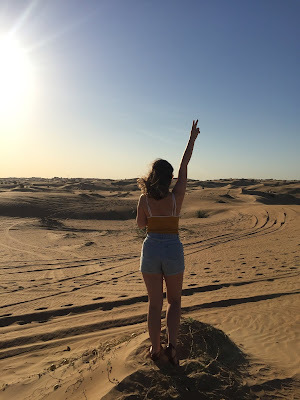 As my 'welcome back' post, I wanted to share a bit of a summary of my thoughts on each country I visited, and then in later posts, write up guides for specific locations, packing tips and all the advice I picked up along the way for aspiring travellers that I'll hopefully help when they're planning their trip. 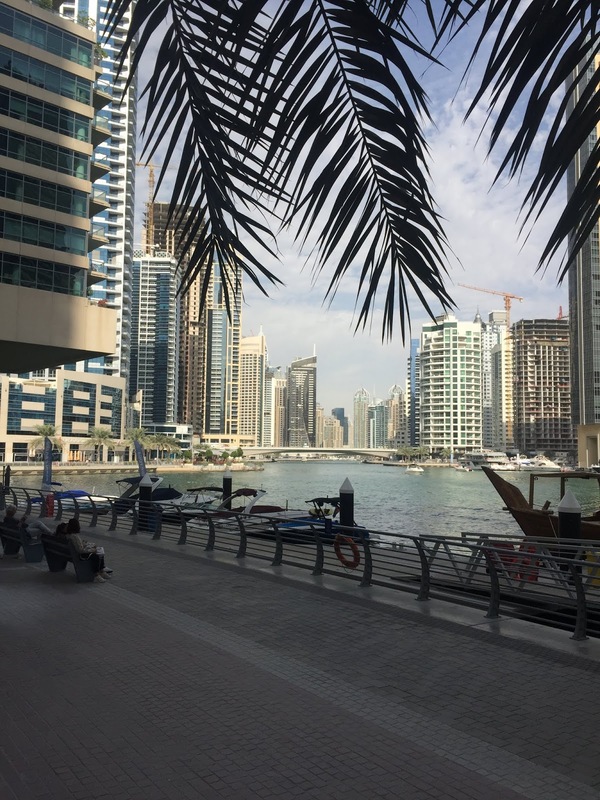 The city of endless skyscrapers, pristine beaches, and every luxury shopping spot under the sun, Dubai was surreal. 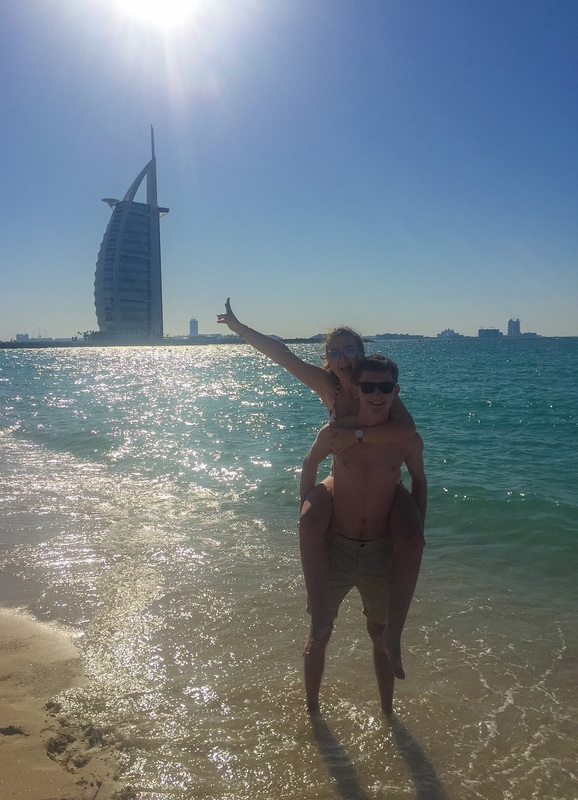 Not the most traditional backpacker destination, however, we stopped off in Dubai for 5 days prior to a trip, one, as a small holiday before the travelling began, and two, as my best friend lives out there. Dubai lived up to every dreamy expectation under the sun. As we stepped out of the airport taxi, the buzz of Dubai hit us. Its crazy traffic, intense sunshine and a picture-perfect sea of skyscrapers looked like something out of a Hollywood film. The thing that really surprised me about Dubai was how new it all was. I know that in terms of being a city, it is all very new, however, every building, restaurant and shop is incredibly clean and looks as if has just been built. And although the man-made look doesn't appeal to everyone, surprisingly it was for me. I loved the luxury vibe, even if things weren't at a luxury price. The sights in Dubai were something else. 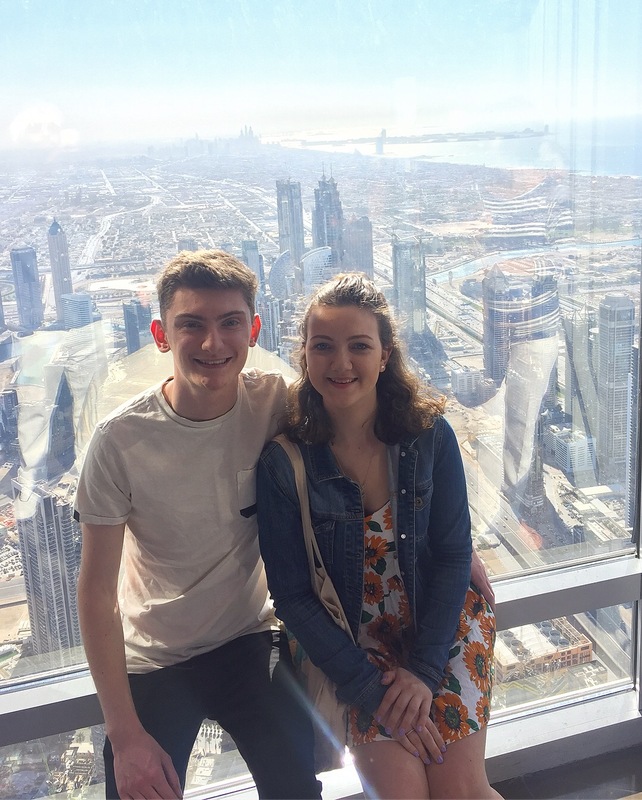 Going up the Burj Khalifa and Burj Al Arab were both unforgettable experiences! 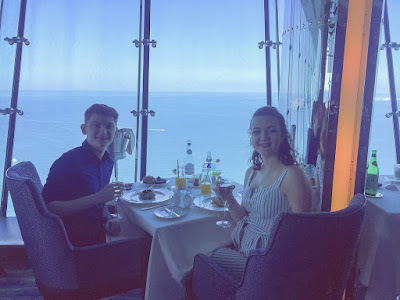 The views of the city literally took my breath away, and the Friday brunch in the Burj Al Arab ( only 7-star hotel in the world) was also insane. It had a variety of the world's best foods and selection of the fanciest and (most delicious) desserts. The desert safari, the beaches, the mall and the people were all amongst the highlights. 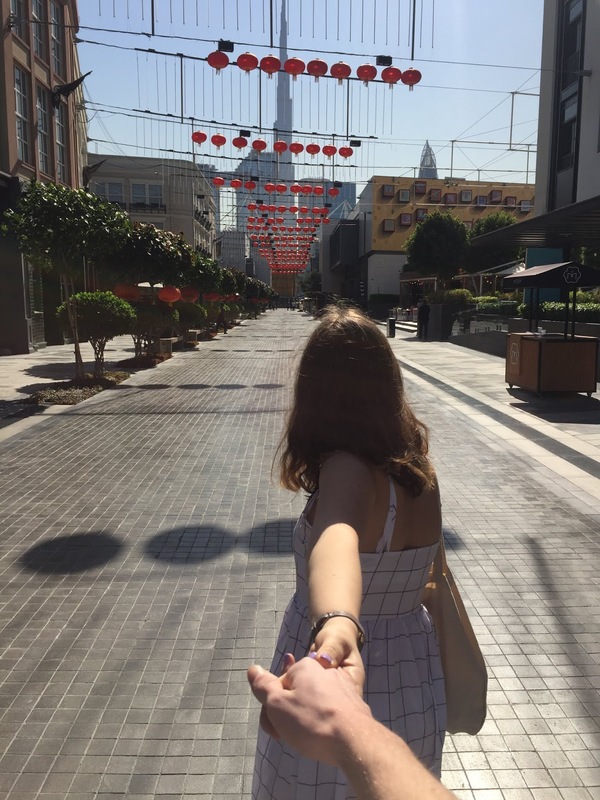 My boyfriend and I both left Dubai in a daze, ready for the adventure that laid ahead. 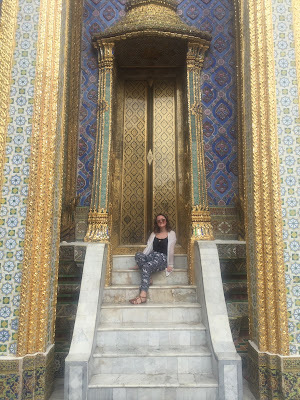 Thailand was the real start to our backpacking journey and opened our eyes to traditional Asian culture. Street markets, tuk-tuks and family-run restaurants soon began a thing of the norm. We soon became accustomed to the Thai's friendly nature and the realisation of why Thailand is nicknamed 'the land of smiles'. Majority of people we met in Thailand were the loveliest humans ever. They were always polite and would go the extra mile for us. As Thailand is a Buddhist country, the citizens are calm and chill which is the complete opposite to the fast-paced lived of our Brits. Their calm nature had a calming effect on me and left me feeling safe and at ease wherever I visited in Thailand. I loved Thailand for many different reasons and fell in love with some areas more than others. 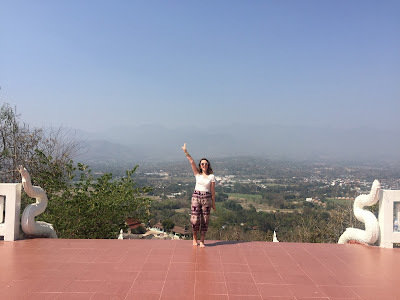 Chiang Mai and Pai were two places in the north that really stole my heart. Chiang Mai had a beautiful and calm vibe about it (especially after being in Bangkok prior). The Old City was my favourite area - the square (as you'll see it on a map) had quaint coffee shops and restaurants at every corner, and it made a fab location for the cutest stroll. Pai, I loved for a similar reason. The ambience was how I pictured Thailand to be, chill with a surrounding view of nature and quirky eateries. Although quite a small place, I'm so happy we added it to our itinerary. Thailand's islands were another highlight of our trip, and something I still can't believe I've experienced. Picture the clearest waters, hot weather and the softest sands, aka, paradise. The islands were stunning as a whole, however, the two that stood out (and I could happily have stayed for much longer) were Koh Lanta and Koh Tao. Both islands were quieter and I suppose 'off the beaten path' than the popular choices of Phi Phi and Phuket. The waters were like a bath, there were vacant beaches, and the locals were even more friendly (if that's possible). 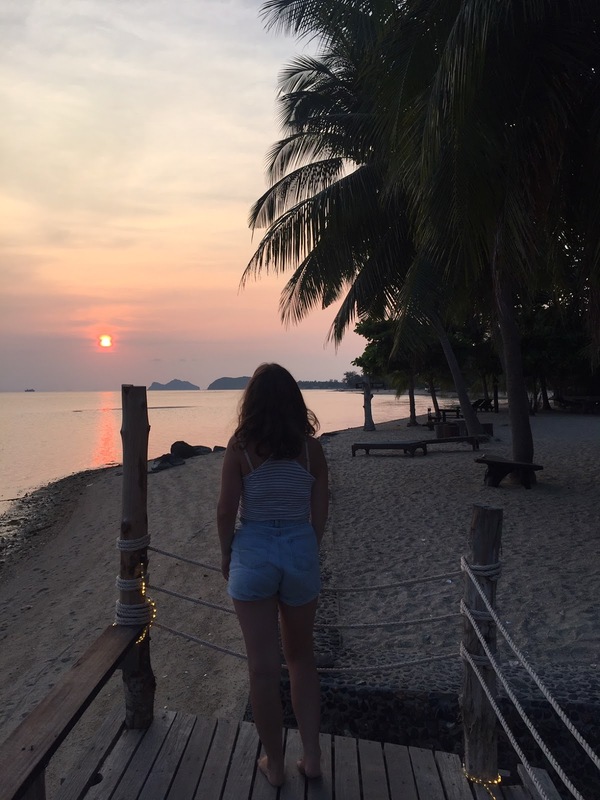 Koh Lanta and Koh Tao I could rave about for days on end. Luxury, serenity and complete beauty. Thailand taught me a lot of things, as we were there for the longest period of time compared to other places. It taught me that living simply is what makes people happy, that family is everything and home cooked food is definitely the best. The culture in Thailand is all community based and that's something completely different to what we have at home unless you're from a village, and I adored that. Everyone was helping out each other, they talk more, and even when it comes to running a business, a family are right there. I'm talking literally - most local restaurants will have children running about and it's honestly incredibly heart-warming! Thailand was a beautiful learning experience. 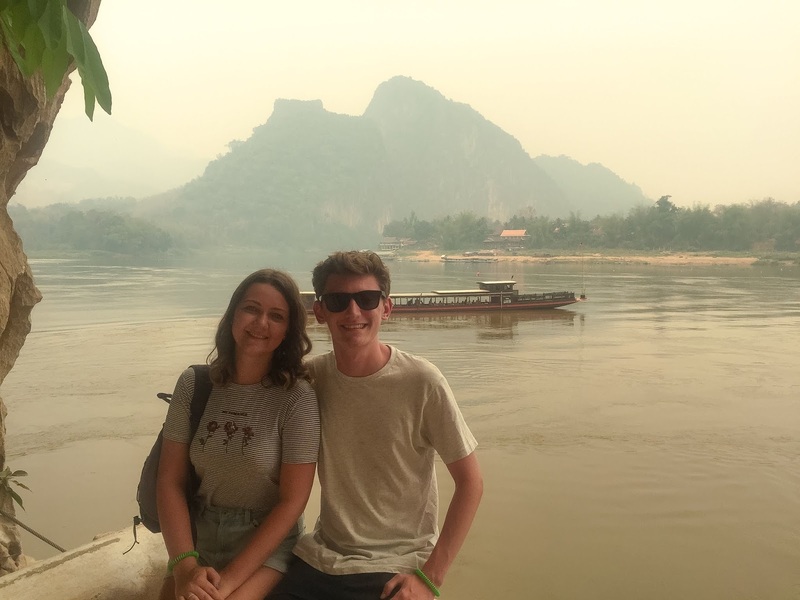 When it comes to Laos, I don't think we had the chance to fully get to grips with its culture and day to day vibe (as we were only there a few days), however, what we did experience was wonderful. Laos was a lot less touristy than Thailand, and a hell of a lot quieter, which is something I loved. Although being in a touristy place makes it easier to navigate and communicate, I prefer when it's quieter and I was able to soak up the sights, without a rush of people snapping photos. Laos had some of my favourite sights, excursions and markets. The temples were endless in Luang Prabang and each was unique to the next. The markets featured handmade items, and I love the French-inspired cuisine everywhere you looked. Laos was quirky and it felt as if it had only just opened its heart to visitors with a lot of the traditional values intact. Cambodia was certainly the country of unforgettable temples and the coolest markets. The capital of Cambodia, Phom Pehn was a lot crazier than I expected and had the same hustle and bustle that Bangkok and Hanoi did - perfect for those who loved the fast-paced life. However, it's the palace, temples and museums were incredibly interesting and amazing to have experienced. My heart, however, was taken away in Siem Reap. Siem Reap is the place of the Angkor Archaeological Park and the iconic Angkor Wat. Spending a few days exploring the temples and watching the sunrise at Angkor Wat was a memory I'll always cherish. It's just amazing how much history each of the temples holds and how I was able to see it all in the modern day. Siem Reap was also home to one of my favourite markets in Asia (similar to Luang Prabang). There were your classic souveniers mixed in with hand made items and trinkets. 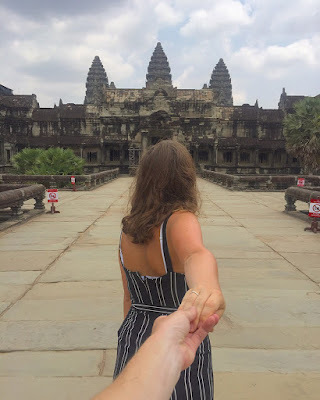 We were only in Cambodia for the week, and although we saw a lot of the history side of Cambodia (something I found incredibly interesting), I think there was certainly more we could have seen and would love to return and adventure in the countryside, and other areas of the country. I feel like I only scratched the surface with Vietnam. We were there for 10 days in total, and visiting 3 different of the cities working our way up from the south to north. Vietnam has the more local appeal out of all the countries we visited, as there would be more like 10 locals to 1 tourist, rather than the millions of tourists you saw in Thailand. I loved that! It felt like Dan and I was the only adventurers in a sea of locals living their daily lives. Every city had a different appeal to it. Ho Chi Minh City was gorgeous and new, but very crazy traffic wise! Out of all the three places, it seemed the most wealthy with fancy shops and renowned chains. But the day trip out of the city has to be a highlight that will remain with me forever. 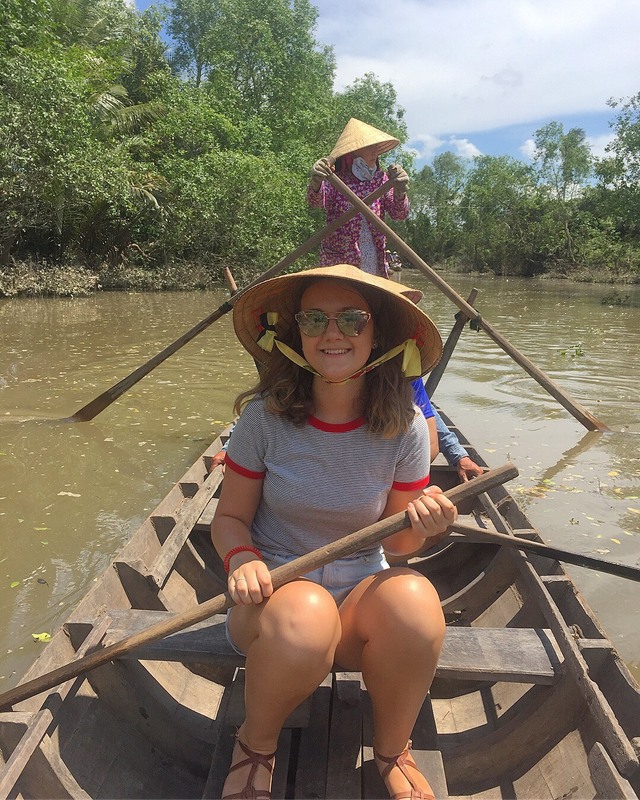 We took a river cruise along the Mekong Delta river and were able to row along one of the village rivers with the traditional Vietnamese hats. It has to be one of my favourite excursions to date! As we went to local villages, we got to meet locals and learn about all the things they make by hand to sell. It was interesting, and tasty eating local delicacies. Hue was a lot different from Ho Chi Minh City and I think my favourite city we saw in Vietnam. It was the calmer and slightly less well known middle city in the country. It's known for the Imperial City which is a walled enclosure within the citadel. Walking around the Imperial City was incredible, witnessing all the temples, ancient buildings and royal buildings. The town area was also beautiful, filled with lovely restaurants and shops, I could have walked around for hours! Hanoi was the craziest out of the 3! I couldn't get over the busy traffic and how packed it was - it's definitely not for the faint-hearted. Although busy, Hanoi had some of the best museums, sights and markets. And, it was the place I took another favourite excursion to Halong Bay. The Bay was absolutely beautiful to sail through and kayak around - I loved it. Vietnam was a wonderful country with interesting cuisine and history that I enjoyed learning about through the course of our stay. I would love to return again! I hope you enjoyed my rambly post about my 2-month experience. Keep your eyes peeled over the next few weeks and months for all my travel posts from this trip. I'm planning plenty of guides and tip style posts. If there is anything you'd like to read about, please let me know in the comments. Have you visited any of these countries? Let's go on a Southeast Asian adventure! Well hello to you my reader chums! 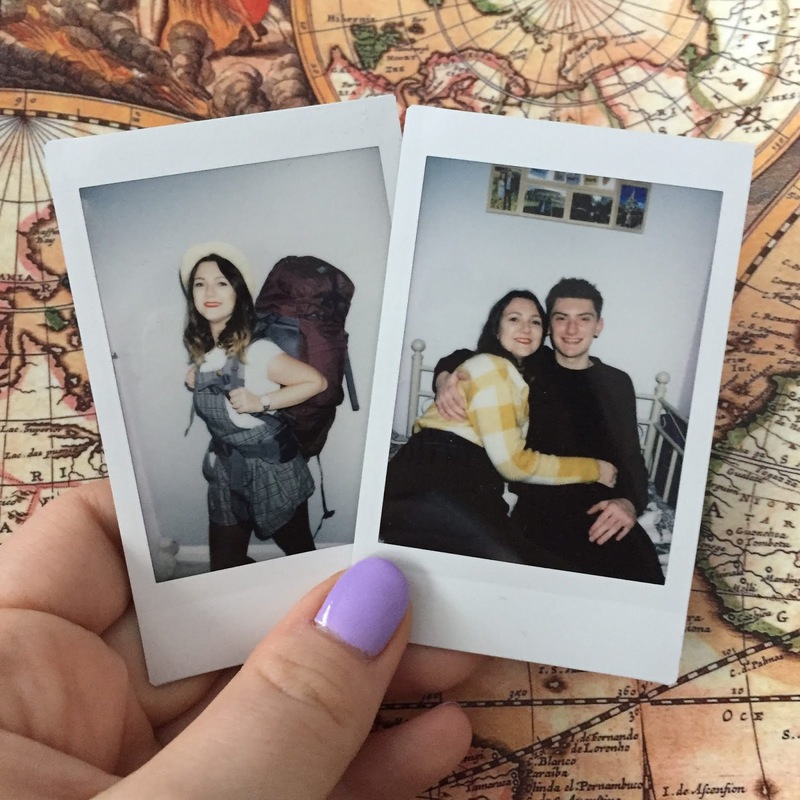 I'm very excited and a bit apprehensive as I type this post, as I'm a day away from going travelling for two months. If you're an avid reader of my blog then you'd know, I'm always planning my next trip abroad, however, I've never done anything on this scale or been away from home for that period of time. My boyfriend Dan and I are jetting off for two months in Southeast Asia with a small holiday to Dubai on the way and we can't wait. It's been on the bucket list to do for a while, so we had the chat last year and began planning, and saving. 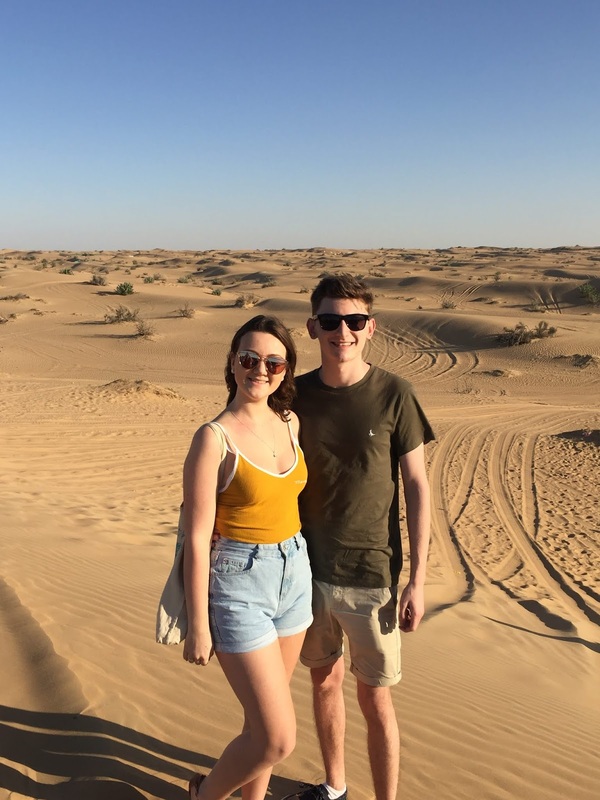 We're firstly stopping off in Dubai for 5 days, spending 5 weeks in Thailand, 5 days in Laos, a week in Cambodia and 10 days in Vietnam, and we can't wait! 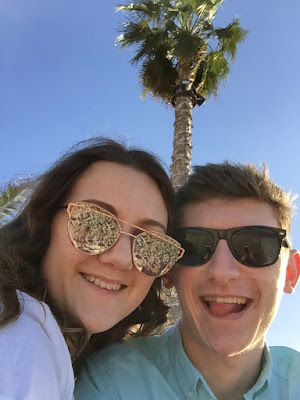 I'm really excited for many different reasons; to experience new cultures, meet people, try new foods, see all the historic sights, relax on some of the world's best beaches, and do all of that with the love of my life. Southeast Asia will be completely different to all the places I've seen in Europe and of course, New York. Although I'm really excited, it's going to be the strangest thing being away from home for so long. I never went to university as it wasn't for me, and have therefore never moved away from my family. It's going to be odd not coming home after a week or two and seeing my family. However, I know how excited they are for me and how excited I am to tell them about my stories. The strangest thing I also think is leaving this blog for 2 months. I've been running this blog since 2013 and posted on it weekly; I think the longest I've not posted is 2 weeks top. So leaving it for 2 months and not posting a thing is going to be a weird concept. However, if you'd love to follow along on my travels, I'm going to try and post loads over on Instagram! I'm also planning to note all my travels down in my travel journal that when I'm home, I can document it on my blog for you guys to read, and also as a memento to keep all my thoughts that I was feeling during my travels. If you're planning a trip just like this, find out how to plan it in my guide. I hope you enjoyed this little farewell post for now. Have you got any travel plans? Well hello to you my reader chums! If you've read my new year's resolutions post, then you'd know, my boyfriend and I are jetting off for a two-month adventure to Southeast Asia in February, and we cannot wait. I began thinking about this last year with my boyfriend and we finally started booking it towards the end of 2018. It's been a lengthy and fun process, and I've much-preferred planning and researching it myself than going through an agency. First things first is to have an idea of which part of Southeast Asia you'd like to visit. Southeast Asia is a huge place and it has many counties such as Thailand, Laos, Cambodia, Vietnam, Singapore, Malaysia and more. You need to initially pinpoint on a map which places you'd like to visit and then figure out the best route. For instance, we're planning on visiting the countries Thailand, Laos, Cambodia, and Vietnam. Before Southeast Asia, we're going to Dubai for 5 days and then jetting off to Bangkok to kick off the two-month adventure. We're in Thailand for the longest period (around 5 weeks) then Laos for 5 days, Cambodia for a week and Vietnam for 10 days. In Thailand, we're covering 10 different locations including the islands. I probably planned it a weird way to how a travel agency would of but it's in the order we would have liked to do things. 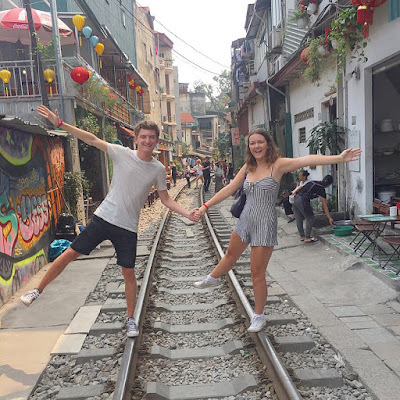 We're going to Bangkok, Chiang Mai, Pai, Phuket, Koh Phi Phi, Krabi, Koh Lanta, Koh Samui, Ko Phan Ngan, and Koh Tao. In Laos, we're visiting Vientiane and Luang Prabang. 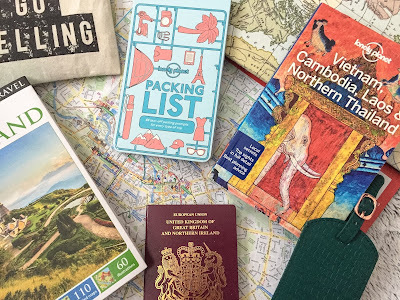 Cambodia, we're going to explore Phnom Penh and Siem Reap. Then, the final leg of the trip is working our way up Vietnam from Ho Chi Minh City to Hue and Hanoi. For every place, I did some research on the optimum time to spend there and pinpointed how long we should stay in each place and added it to the agenda. Once you've chosen where to go, you need to consider the costs of everything and how you're going to budget for the trip. Even though the typical travelling style is by backpack and staying in dormitories - you don't have to do that. It all depends on your budget and working in your means. You'll find when travelling to Asia that the flights are the biggest costs, and accommodation, and the food is very affordable. We set a rough budget of how much the trip would cost and then found hostels/hotels and travel which would fit around that. We booked everything place by place and worked our way through the agenda, ensuring we kept the costs as low as possible. As dormitories weren't for us, we decided to book a private room in each hostel and hotel - and surprisingly, it wasn't as costly as we thought, and widely available. Your health is ever so important, especially when you're travelling as the last thing you want to do is feel ill far away from home. This is why it's important to check which vaccinations are essential for the countries you're visiting. You can easily do this by phoning up your doctor's surgery and talking to the nurse. She'll inform you of what you've already had and which you should get for the countries you're going to. It's also worth considering buying probiotic tablets. In Asia, a lot of the food isn't prepared or handled the same as in Europe that you could be at risk of food poisoning on your visit. To build up your stomach lining and prepare it for that, take some probiotics a couple of weeks before you go, and when you're there. You'll also need to do some research into which visas you're going to need on the trip, and that depends on the countries you're visiting and how long you're staying there for. For example, as we're in Thailand over 30 days, we needed to buy a tourist visa, which you can easily send off for at the Post office by filling out a form on the Thai embassy website, alongside your passport and two photos. We also needed one for Cambodia, as the majority of people do when they enter that country. Do your research beforehand, rather than worrying and not being allowed entry upon arrival. Likewise, with vaccinations, travel insurance is also essential. There are loads of policies you can get online that cover you for your health, luggage cover, electronic cover and for things like activities. You can easily fill out a form on what you'd like to cover and buy it at a click of the button. It's also worth noting that most policies only cover the 60 day period of travelling in one go - so if you're going for longer, make sure to check with your current policy on buying another one. I'm going for around 68 days so I had to get another policy to cover the last 8 days. As you're going for a long period of time, the last thing you'd like to do is carry around lots of cash for different countries and that's where the money travel card comes in handy. You can pick these up at your local post office, and once activated add loads of different currencies onto it. Certain currencies aren't available on the card but again, just do your research. There's also a handy app that goes with it which means, you can add money to it just from your phone whenever you like! Once all the essential things are in place, you can research and plan everything you want to see when you're on your travels. I personally like to write out a whole agenda and break it up day to day with a rough list of everything we want to see in that day. There are plenty of travel blogs online or books like Lonely Planet that is packed with information on what to see/do. A couple of weeks before you go, it's important to make a list of all the essential things you need to buy such as suncream, bug spray, and all your toiletries. If you're backpacking, remember, the less you pack the better so be wary of that as you're purchasing things for the trip. The final step is making the packing list and getting prepped for your trip of a lifetime. If you write everything to pack down then you're more likely not to forget the essentials such as your visas, money or passport! I hope you enjoyed this how-to travelling guide! Are you planning a trip anytime soon? Well hello to you my reader chums! It's a new year and I've got back into my favourite hobby, reading. 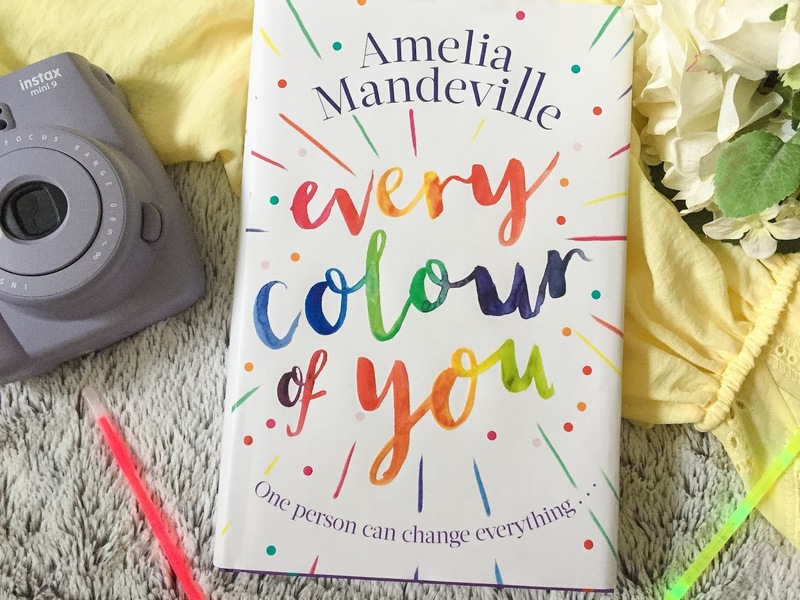 With life always being so busy, it's hard to find the time to sit down and delve into a book, however, over the past few days I finished a book which I started over Christmas and fell in love with - Every Colour of You. I pre-ordered this when the author, Amelia first announced it was coming out as we both have the same dream of being writers so I couldn't wait to read her work. The story follows the life of Zoe and Tristan who are complete opposites to each other. 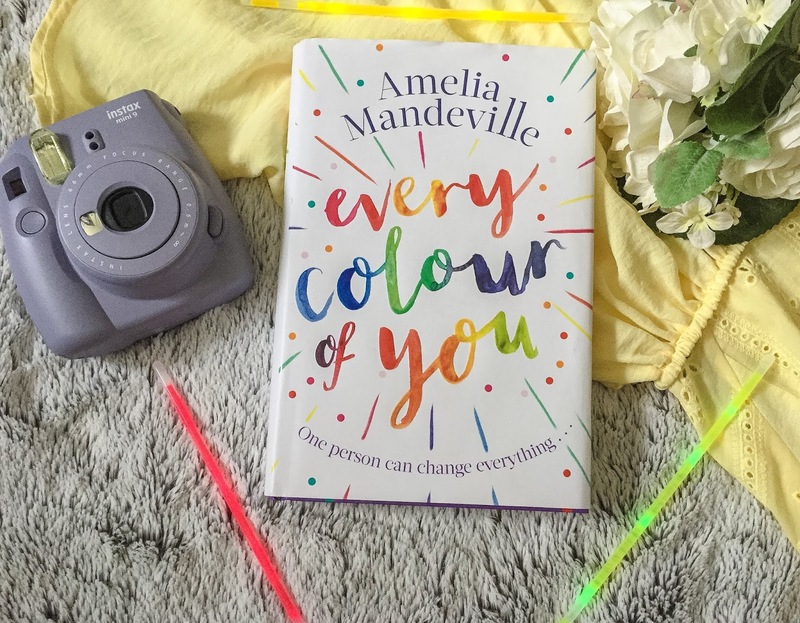 Zoe is full of colour and life, she loves experimenting with hair colours and lives life to the fullest every single day - even if she spends a lot of her time working in the supermarket. Zoe meets Tristan who rumour has it, his dad recently passed away and his life has fallen apart. After reappearing after months of being away, Zoe realises Tristan is struggling with sadness she can't fully understand, however as the bubbly character she is, she's determined for him to overcome it. But the harder she tries, she realises, it's not going to be easy and it's something she can't fix. My favourite part with any story is the characters and this book is no different, I fell in love with them and the bond between Tristan and Zoe. 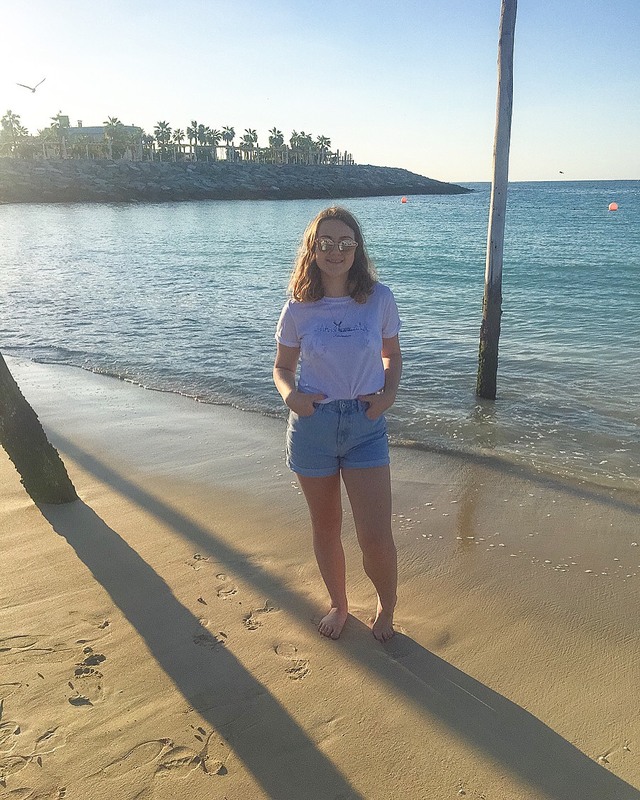 Zoe comes across from the off as an excitable and enthusiastic being that everyone needs in their life to spur them on to do everything they want to do. She's so full of life that her energy bounces off the pages of the book. I loved the determination she had when she first met Tristian - determined that they were going to be great friends, and it worked. Tristian, I related to on another level. He suffered from depression and the book really brought light to the effects of mental illness and the reality of living with one every single day. This is so very important and will help the readers who are also suffering not feel so alone. He may be fictional but every word written about his feelings is raw and true - the author got it so right. Their bond together is something incredibly magical - when they start getting into being close friends and are inseparable, they do anything for each other and it's lovely to read. Zoe helps him in every way that she can, and over the long run, it has the positive impact it should for him to get his life back on track. Tristan's brother Luke also played a big role in the novel and showed the impact grief and mental illness can have on a family - they fought loads but at the end of the day, Luke was the caring hero for Tristan and looks out for him in every way possible. Other characters included Jerry and Paul, Zoe's two dads, and her sister Leia. I also loved in this novel, the diversity it had in showing a gay family instead of your typical mum and dad unit. Jerry and Paul also brought light to the book, and their relationship with Zoe is relatable for every parent-daughter bond. 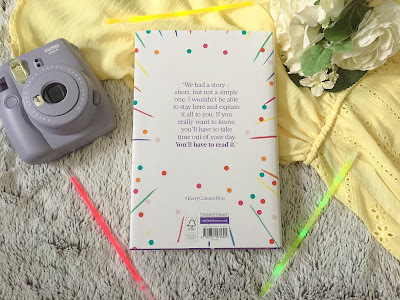 The characters make you want to read on and on and see what's going to continue happening in their lives! Every book's structure is always something to comment on, and I loved how this one was laid out. It gave you both the perspective of Zoe and Tristan and flipped between to the two either in the same situation or afterwards. That quick change really made the read additive as I wanted to hear more and more, and find out what happened next. 1st person is my favourite way of books to be written as it's much more personal and you can relate to the characters even more. The ending pulled my heartstrings in so many ways and to be honest was really unexpected. It kind of took a sharp turn in the last few chapters and what I thought would happen, didn't happen. It's emotional but in a way enlightening - and you really need to read it to find out! 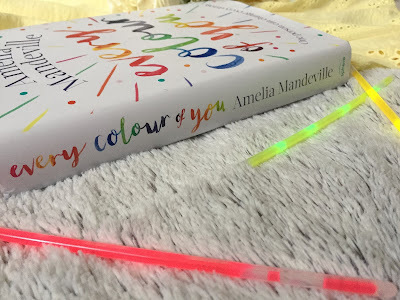 Overall, I really enjoyed this book, it was such a page-turner. The book focused on many knowing issues today, shared a bond of love that was so real and really left a place in my heart. It shows you what life is really about, what matters and not to take anything for granted. If I were you, I'd pick it up when you're next in Waterstones! I hope you enjoyed this book review. Have you read Every Colour of You? Well hello to you my reader chums! Whether you're heading on your next city break or departing for a backpacking adventure, it can be tricky to know what to pack, especially if you're travelling light. My new and favourite everyday item, a Chillys bottle. 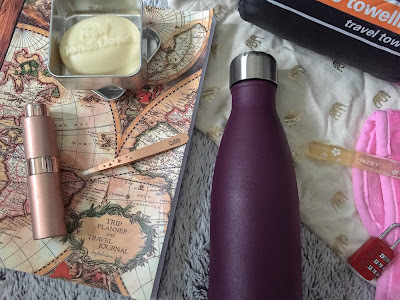 I've always been an avid water drinker, ensuring I drink a lot every day and relied heavily on a reusable water bottle. However, after I received this for Christmas, my water bottle days had got much better. It does exactly what it says - keeps water cold for 24 hours. Every time I drink from it, the water is cold like it just came out of the fridge. This is why it's the perfect thing to take on your travels. If you're travelling to warm climates, it'll keep your water cool all day long, and it's eco-friendly too. When I go travelling, I always find that I'm unable to bring my favourite perfumes as they're too big or there's no way of transporting them. However, when I was kindly sent this atomiser, all my prayers had been answered. I was finally able to transport my perfume without having to buy rollerballs! This tool allows you to put your favourite perfume in the bottle and take it wherever you go. You can buy yours at the Fragrance Shop. As I travel, I'm bound to shop along the way and bringing a tote bag or two will come in handy with that. They can also be used as a beach bag (easier to fold in the backpack), and for your dirty laundry. Tote bags are also an eco-friendlier way to carry things around rather than purchasing different plastic bags along the way. Despite now having my hands on an atomiser, I still love my rollerball perfumes. They're small and thin and if you bring a few, you'll have a couple of scents to enjoy. For my travels, I've invested in shampoo and conditioner bars as one, they're environmentally friendly and two, they're easy to travel with. Both shampoo and conditioner bars can last for a series of washes and be transporting in little tins to keep the moisture in. They'll save space as your packing and still allow the luxury treatment of a good hair wash. When travelling, the last thing I think about is getting my eyebrows wax, however, tweezers are something that always comes in handy for a multitude of things. I've recently been sent these Rubis tweezers and they're amazing! The tweezers are stronger than other ones I've used and feel really well made. They are acid-proof, anti-magnetic and rustproof - and are designed for perfect precision. Towels inevitably take up plenty of room when packing that you need to get your hand on a microfibre towel. You can buy microfibre towels in places such as Mountain Warehouse, and they are much more compact than your usual towel. Depending on what your travel plan is can determine how much makeup or beauty products you'll bring with you. One of my favourite and efficient ways to remove makeup I've found is by the wipeout cleansing cloth. All it takes to remove makeup is water on the cloth - and honestly, it really does work. The cloth is quite harsh but also soft enough to swipe over the skin. As they only require water, I won't have to pack any other form of makeup removal and it can save space. It goes without saying but if you're planning using any electronics abroad then you need an appropriate adapter. Alongside that, I would always recommend packing an extension lead as then if the hostel/hotel only has one plug, you can have more than one. Something we can't control is the weather, and wherever you may be going the weather can take a turn for the worst at any moment. Therefore, I'd recommend bringing a rain mac with you. They're compact and light, and can easily fit in your luggage. Accidents happen and are never planned so it's always good to be prepared with a first aid kit at hand. When travelling, you'll be involved in a lot of flights and going from place to place that a bit of quiet is always nice. Bring along some earplugs and you can get a good night sleep wherever you are in the world. You need to be safe and so do your belongings as you don't want anything going missing. Before you leave, get a secure padlock and attach it to your backpack. I hope you enjoyed this post. 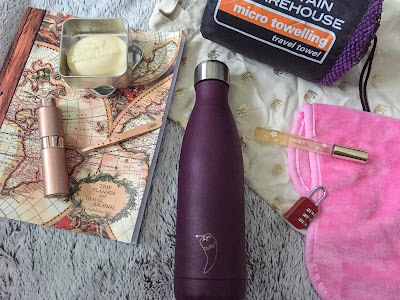 What other handy items would you bring travelling?